The ongoing England A v England B 4-day warm-up match in Loughborough provides significant clues as to how England plan to line up in this summer’s Women’s Ashes. Openers It looks like England’s preferred opening partnership might be Heather Knight and Lauren Winfield, with Charlotte Edwards dropping down to 4. Personally, I’m not convinced about this – Edwards’ “play every ball on its merits” approach is perfectly suited to the opening role; while Winfield’s attacking shot-making can really only be justified opening in T20, and even there it is debatable, because while Edwards doesn’t tend to do the spectacular, she does the unspectacular so well that even when she is accumulating, she accumulates more quickly than most. Middle Order With Taylor coming in at 3 and Edwards at 4, this leaves just one space in the middle order, which you’d expect to be occupied by Kent’s Lydia Greenway. If she fails in the ODIs, then perhaps Amy Jones (who is reported to have batted beautifully making a century at Loughborough) is an option for the Test, but only “if”. 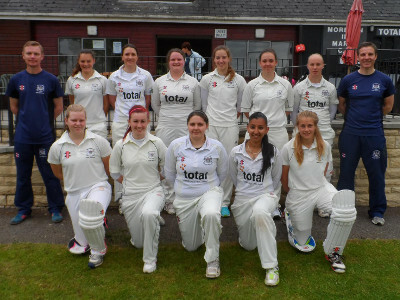 All Rounders Despite making another duck in the warm-up match, to go with the two GOLDEN quackers she has bagged in this year’s Women’s County Championship, Nat Sciver’s place is bolted-down for the foreseeable future. Joining her, I’d expect to see Laura Marsh, who offers good, solid batting cover in the late-middle-order, and the ever-dependable Jenny Gunn; although Georgia Elwiss, who is one of just two players to come out of the last winter with her reputation genuinely enhanced (the other being Alex Hartley) is another option here. Fast Bowlers It’s pretty clear that England still see Kate Cross as the back-up to Shrubsole and Brunt. I think Cross’ batting has something to do with this, because although she has made 50s in the Women’s County Championship, at international level she is seen very much as a “Genuine No. 11”; so barring injuries, it seems unlikely that Cross will play in the ODIs. But the real question is whether England can risk injury-prone Katherine Brunt in a four-day Test match, however well she is bowling? If not, that is where opportunity is likely to come knocking for Cross. Spinners With Heather Knight offering a classy enough turning ball to open the bowling recently in T20s, and Laura Marsh filling an all-rounder slot, you have to ask if England even NEED a full-time spinner, and whether playing Cross in the remaining slot might not be a better option? Nevertheless, I’d be surprised if England take the field without one of Dani Hazell or Becky Grundy. Grundy was the one in the driving seat more recently, but Hazell has been working hard on a more attacking, wicket-taking approach so I wonder if it is her we’ll be seeing more of this summer? Knight, Winfield, Taylor, Edwards, Greenway, Sciver, Marsh, Gunn, Hazell, Brunt, Shrubsole. Coming off the back of a first match victory, the Imps were hoping for a repeat performance as they travelled to Northumberland on Sunday. With overcast conditions and a green tinge in the pitch, captain for the day Rachael Dyer elected to field first and put the hosts into bat. Amy Halloran took the new ball utilising her pace and looking to make the most of the conditions. Beth Smith came in from the other end aiming to use her experience to reduce runs and potentially pick up a wicket or two. The pair bowled well, gaining a lot of movement, but unfortunately the opening batting pair of Hawes and Gillott were unyielding. A change of bowling to try create a breakthrough was put in place but by drinks the hosts were 150-3. Sloppy fielding and loose bowling had let the Imps down; even with some excellent moments in the field (Smith gaining a run-out and Becki Brooker taking a sharp catch), it was not to the necessary county standard required. At drinks, coach Alan Ward gave Lincs the target to not let Northumberland get more than 230 as a total, meaning the Imps had to sharpen up both in the field and with their bowling! Lincs looked to be a different team in the second 25 overs. Wickets came from Halloran, Dyer and Smith, with further excellent pieces of fielding: another run-out for Smith, and two more sharp catches for Brooker. Halloran came back on to finish her overs from the opposite end, bowling tightly, and ending with figures of 2-32 in her 10 overs. Smith also returned to finish her overs, finally gaining a wicket (caught and bowled) after having some close chances in her first spell. She ended with 1-30. This improved fielding performance managed to restrict the hosts to 247-7 from their 50 overs. It was a tall order, but with the pitch holding firm and with what looked a long batting line-up, Lincs felt they could chase down the runs. India Freeman joined Smith to open the batting, with the first aim being to get to 10 overs without losing a wicket. 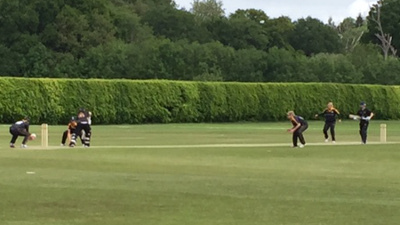 The pair were ticking the board over steadily until Freeman received a quality delivery from Ali which cleaned her up, bringing Brooker to the middle after 4 overs. Brooker got a quick fire 12 before also receiving an unplayable delivery by Ali, and Halloran followed the next ball shuffling across her stumps to be given LBW – the irony being that Ali had to be taken off in her next over for bowling 3 no balls on height! This left Lincs 31-3 off 7. The instructions for the incoming batsmen were now to survive for a few overs before looking to press for runs. Unfortunately, Smith was gaining new partners at a steady rate. Lucy Rollinson, Dyer and Abbie Johnson all came in then back out without troubling the scorers too much; some well-timed shots sadly went straight to fielders. Samantha White joined Smith at the crease and the two saw the Imps to drinks with the score at 80-6. With victory now out of reach, the instructions at drinks were to use time in the middle as batting practice, and try to get as many extra batting points as possible. But even with this being said, two overs later Smith attempted to take a non-existent run to Ali and got herself run-out with a score of 34. The remaining batsmen only managed an additional 8 runs before Lincs were all out for 96 in the 34th over. Ultimately it was a disappointing day for the Imps as a result of 15 very poor overs in the field, resulting in 46 extras (the top scorer of the day). This, coupled with two of the top order receiving top quality deliveries and only two batsmen making double figures, means there is a lot to improve upon before the first round of the T20 competition on the 14th June. 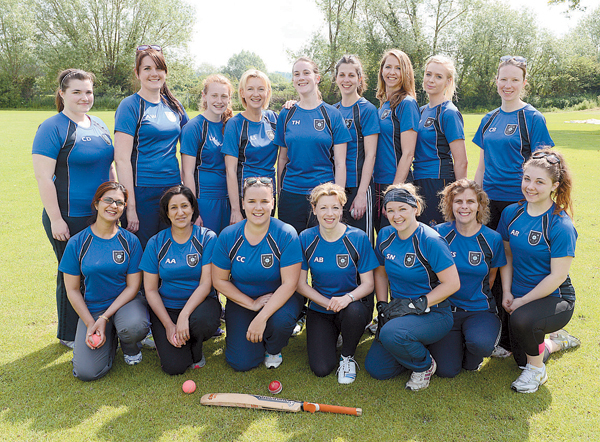 On a difficult batting pitch, it was Berkshire’s bowling unit that shone as they bowled Nottinghamshire out for 145 to achieve their first win of the season, triumphing by 37 runs. With Berkshire defending 182, opener Daisy Gardner, bowling with pace and movement, looked fired up from the outset, removing Notts opener Zoe Richards with only the fourth ball of their innings, LBW for a duck. Then in Gardner’s next over, Danni Wyatt was run out. Looking to take a sharp single, backing up off an LBW appeal, she was sent back but slipped. 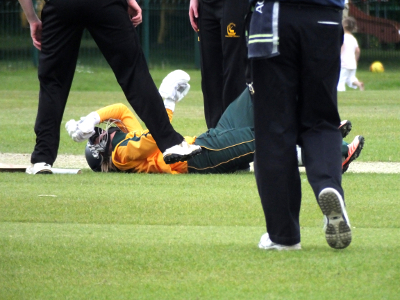 Berkshire celebrated the wicket, but it soon became apparent that Wyatt was in some pain with her shoulder, and it was several minutes before she was able to walk off; with hospital scans later showing a dislocated shoulder and a minor muscle tear but no serious damage. It then went from bad to worse for Notts, as Sonia Odedra was adjudged to have edged Heather Knight behind for the Outlaws’ second duck, leaving them 5/3. Notts’ veteran ex-England glove-butler Jane Smit provided some fight-back in the early part of the innings, before being brilliantly caught by Heather Knight, running backwards at mid off from the bowling of Fi Morris. 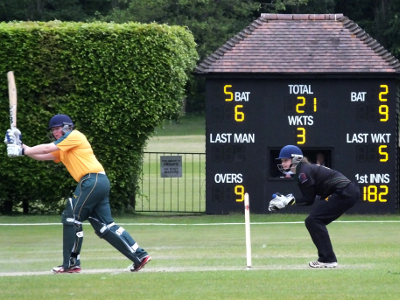 It was then Jenny Gunn who took up the resistance, with a cool and collected 52*, but the drip-drip-drip of wickets continued, and Gunn eventually ran out of partners as Berkshire celebrated victory in the 47th over. Earlier, Berkshire had won the toss and elected to bat on what captain Knight described as looking like a “belter of a pitch”. However, appearances were deceptive and runs proved difficult to come by against a quality Notts attack. Opening the bowling, Sonia Odedra looked every bit an international-class bowler; while Danni Wyatt sent down 10 metronomic overs, returning an excelent 2/17. Knight played well, taking most of the runs from an opening stand of 56 with Alex Rogers, before being comprehensively bowled, playing down the District Line to Jenny Gunn. All eyes were then looking out for Aussie superstar Alex Blackwell, but she opted to come in at her usual position of 3-down, pairing conservative stroke-play with some assertive running to keep the scoreboard ticking, if not tocking, at around 3 runs per over. By the 40-over mark, Berkshire were 130/6. They were able to accelerate a bit in the last 10 overs, but finishing on 182, they still fell some way short of the 200 needed for maximum batting bonus points, perhaps showing the unfairness of that system in these kind of circumstances. However, it proved to be enough for the win and by bowling Notts out, maximum bowling bonus points were achieved*. Berkshire will be hoping for a repeat performance in today’s match against Yorkshire, also at Finchampstead. * Technically… by taking 9 wickets, maximum bowling points are achieved.